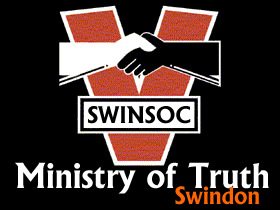 » Blog Archive » Swindons Ministry of Truth: Councillors Re-writing History of WiFi-Lies? Just days after publishing ‘More WiFi Lies Busted: Vindication & Exoneration For the ‘Swindon 4′ I can reveal that Swindons Conservative councillors are already re-writing recent history as they attempt to escape the consequences of their smear campaign against members of the public. “The smear campaign reached a critical point when, on the 7th of February 2011, Councillor Perkins told Swindon Borough Council’s Scrutiny Committee that West Lothian Council had received vexatious emails and/or phone calls from a resident(s) of Swindon, and that these ‘vexatious’ communications had convinced BathGate to terminate their involvement with Digital City (UK) Ltd. Yesterday it became apparent that Councillor Andrew Bennett, a Conservative member of the Swindon Borough Council Scrutiny Committee, was hurriedly telling anyone who would listen that Deputy Leader of Swindon Borough Council & Director of Digital City (UK) Ltd Cllr Garry Perkins had not claimed that members of the public were responsible for Enterprising Bathgates rejection of Digital City, but had instead told the scrutiny committee that the rejection was caused by ‘media coverage’ of the WiFi’asco. Luckily for us, Des Morgan and Chris Watts make copious and accurate notes which have proved to be more reliable than the ‘official’ minutes of Scrutiny meetings which, in the drafting process, are often subjected to political ‘modification’. Des and Chris are both clear on what they heard, and on what they recorded in writing and both their accounts consistently concur in that Rod Bluh, Rikki Hunt & Garry Perkins referred to ‘external interference‘ in Digital City’s Bathgate Bid no less than 6 times during the meeting. I hardly need point out that ‘external interference’ is very different from ‘media coverage’. It is also recorded and remembered by several people present that Cllr Perkins made much noise about submitting a freedom of information request to West Lothian Council about the ‘external interference’. The above request looks very specific and very personal and does not suggest that the author of the request was at all interested in ‘media coverage’. Further to this, despite Enterprising BathGate and West Lothian Council quickly and transparently publishing their reasons for rejecting Digital City (UK) Ltd, Councillor Bennett is now promoting the notion that the rejection letter is a ‘cover-up’ for the real reason for rejection which was, according to Councillor Bennett, because of vexatious emails and communications received by Enterprising BathGate, from members of the public. I probably don’t need to spend much time getting forensic on Cllr Bennett, but I will point out that his statements appear to be mutually exclusive. They can’t both be right, so I’m left wondering whether he is paranoid, particularly stupid or involved in promoting yet another wifi lie at someone else’s behest? “Following the submission of the feasibility study of Bathgate Wi-Fi Zone I can confirm that the Board of Enterprising Bathgate have elected to not proceed with the scheme for the reasons outlined below. If Councillor Bennett is sincere in his belief that West Lothian Council is complicit with Enterprising Bathgate in covering up the ‘real’ reasons for the rejection, I hope to see him put some meat on the bones and prove it, and do so quickly because I have a strong feeling that this is going to escalate further. I understand that as late as yesterday morning, Cllr Peter Heaton-Jones, (another member of the Scrutiny committee), confirmed that his recollection of events and oral statements at the scrutiny committee meeting concurred with those of Des Morgan and Chris Watts. It will be interesting to see whether his recollections will start to resemble those of Councillor Bennett and whether the publication of the meetings minutes is being delayed because they are currently within Swindons very own Ministry of Truth.